Eleutherococcus senticosus is an adaptogen with thousands of years of use in the Far East where it’s commonly called Siberian Ginseng, despite the fact that eleuthero is NOT a type of ginseng at all. This is because, like true ginseng, it’s also a root which is used in TCM as a yang tonic. Eleuthero came much better known in the West following intensive usage by Russian Olympic athletes in the 90s. Unlike a stimulant such as caffeine, Eleuthero doesn’t give a rush of energy followed by a drop as it wears off. Despite some saying it is energising, it is not a stimulant and is not a listed doping substance according to WADA. Eleutherococcus senticosus is an adaptogen with thousands of years of use in the Far East where it’s commonly called Siberian Ginseng, despite the fact that eleuthero is NOT a type of ginseng at all. This is because, like true ginseng, it’s also a root which is used in TCM as a yang tonic. Yang tonic herbs are those which support kidney qi function. This is considered vital in TCM since the kidney’s yang qi, in it’s philosophy, is our life force. When it ebbs away, we become weak and feeble.In modern times, we use the term adaptogen for many of these herbs. That means a herb which supports the body’s ability to adapt to physical and mental stressors, so helping to maintain physical stamina and well-being. Eleuthero came much better known in the West following intensive usage by Russian Olympic athletes in the 90s. 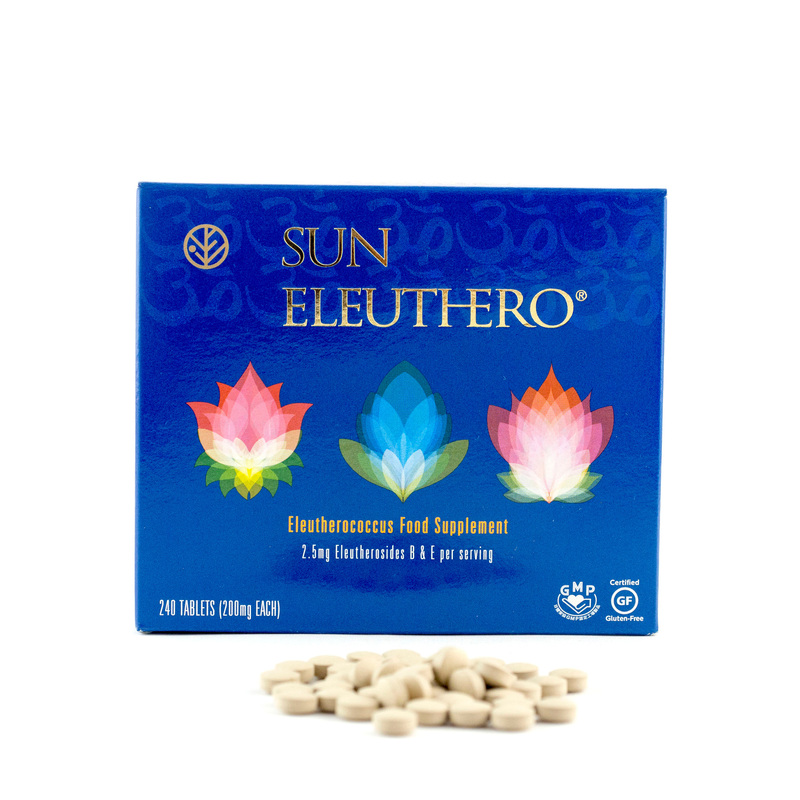 Unlike a stimulant such as caffeine, Eleuthero doesn’t give a rush of energy followed by a drop as it wears off. Despite some saying it is energising, it is not a stimulant and is not a listed doping substance according to WADA. Sun Chlorella Corporation of Japan have long held the reputation for producing the finest quality food supplements. They even inspired the late famed American naturopathic doctor, Dr Bernard Jensen, to write a book inspired by their sophisticated and refined processes to make the best quality supplements. 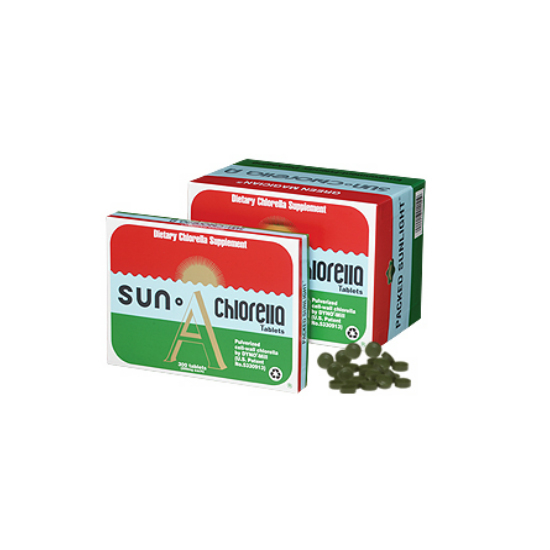 Unlike many Western manufacturers who make anything in a pill, Sun Chlorella Corporation chose to only make two products but be the best in the world at them. The first is their Chlorella, taken by the likes of heavyweight boxer David Haye and celebrities like Jennifer Anniston and Miranda Kerr. Their other is Eleuthero. Made in Japan to the highest standards, including Certified Gluten Free and GMP (Good Manufacturing Process), this is a carton with 240 Sun Eleuthero tablets in. Each serving contains 2.5mg of Eleutherosides B and E. The ingredients in each tablet are eleutherococcus senticosus root powder and acacia gum, which is a bulking agent. There are no other ingredients and the tablets are made in Sun’s typical high quality small, rounded shape for easy swallowing. This carton has 240 tablets in it. A suggested daily serving is 12 tablets per day. Since herbalists typically suggest regular use for a period, say three weeks, for effects to build, followed by a short break, a carton of 240 is considered a month’s supply. © 2008 - 2017 The Detox Shop. All rights reserved.